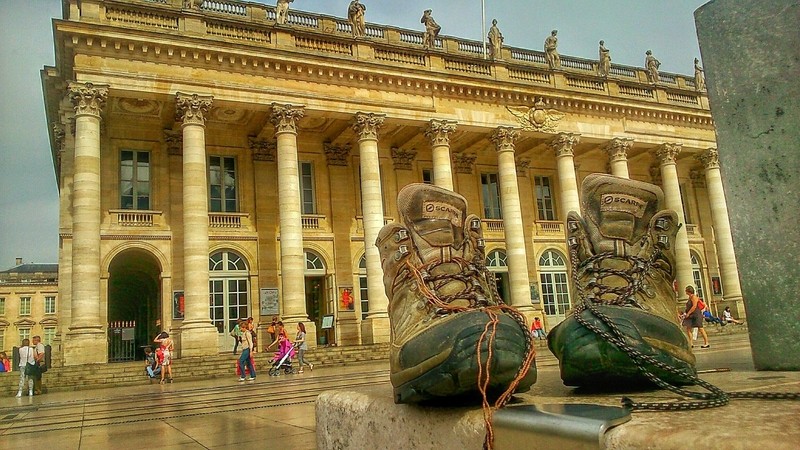 Day 37, 15:39 – Bordeaux | Starsway - The unforgettable walk! Bye Bye my friends, you’re retired now and free to do whatever you want to do. It was an honor to walk with you. Maybe you find someone who likes you. All the best. These shoes were hurting me, since Aachen! They were fantastic shoes, I neve had problems with them, but I guess they changed their shape by the solar insulation when I left them for week on the terrace of my house. I hoped they would return to fit after some km walking but this was not the case. Latest, when the area around my right shinbone got swollen for some days, I decided to change them. Bordeaux was a sufficient large place to find some new boots because in the smaller towns, there were no sport shops at all. Very often, I didn´t even see a tennis or soccer place.